infertility procedures, operative hysteroscopy, pelvic floor repair, and laparoscopic management of gynecologic malignancy. High-quality color pictures supplement many of the presentations. The three editors have pioneered some of the most important laparoscopic procedures used today. Their work has opened up the video laparoscopy field for surgeons worldwide. 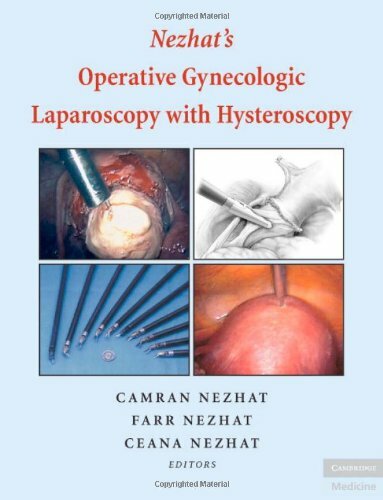 The contributors have extensive experience in laparoscopy and hysteroscopy, and many of them have established some of the surgical techniques discussed. Camran Nezhat, MD, FACOG, FACS is Director and Fellowship Director of the Center for Special Minimally Invasive and Robotic Surgery, Stanford University Medical Center, Clinical Professor of Obstetrics and Gynecology at the University of California at San Francisco and Adjunct Clinical Professor of Surgery and Obstetrics and Gynecology, Stanford University School of Medicine, Palo Alto, CA, USA. Farr Nezhat, MD, FACOG, FACS is Professor of Clinical Obstetrics and Gynecology at Columbia University College of Physicians and Surgeons, Director of Minimally Invasive Surgery and Gynecologic Robotics and Director of the MISGR Fellowship Program, Division of Gynecologic Oncology, St Luke's-Roosevelt Hospital Center, New York, NY, USA. Ceana Nezhat, MD, FACOG, FACS is Clinical Associate Professor in the Department of Obstetrics and Gynecology at Emory University School of Medicine and Stanford University School of Medicine and Chair of the Department of Obstetrics and Gynecology, Northside Hospital, Atlanta, GA, USA.